Before you head out for one of the most important nights of your life, don't forget to pack your purse with these top ten prom night essentials. The last thing you want is to feel uncomfortable or embarrassed because you weren't prepared for the unexpected. 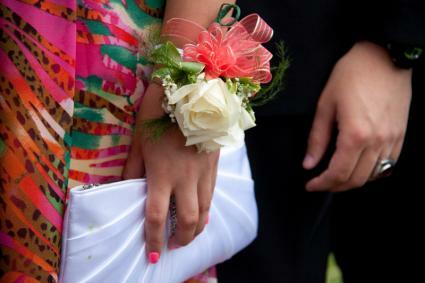 All of the following top prom night essentials can fit conveniently in your purse. If you're not bringing a purse or planning on a tiny one, you may want to reconsider and purchase an evening purse instead so you can take these important items. You will look beautiful when you walk out of the salon or your bathroom and you'll want to keep it that way, so bring some touch-up makeup. This includes pressed powder to combat shine and lipstick or gloss to freshen up your lips. Prom night can be emotional and you may cry. Wear waterproof mascara or bring eye makeup remover pads and eyeliner, mascara and eye shadow to redo your eyes. Anything could happen to your dress - you or someone else could accidentally step on it and rip it. Having a small-sized sewing kit gives you the ability to do an emergency prom dress repair. A sewing kit will also have some pins in case your dress doesn't fit as well as you thought it would while dancing. Being around many other people may make you feel warm and you will definitely feel hot when having a good time dancing for hours. Don't be embarrassed by body odor, especially around your date! Pack some trial size deodorant and/or perfume so you can smell just as pretty as you look! One other thing, don't forget to buy the deodorant that is invisible because you definitely don't want remnants showing on your dress. Fight another embarrassing moment of having bad breath by having gum and mints available. You'll be talking loudly and close to your date and friends to be heard over the music, so you don't want them to go running the other way. A good way to remember to pop a mint or gum is to do so every time you eat or drink something or use the restroom. Okay, maybe it's not an essential, but you'll appreciate that you took the time to bring your camera a couple of years later. You'll look back on this moment and feel all of the magic of the good times you had. If you are wearing high heels with your prom dress, bring some shoe glue in case one of your heels breaks. Simply grab the broken piece and put some glue on it and then some on your shoe. Hold it securely in place until the glue dries and bonds the heel to the shoe. Be careful when you put your shoe back on and start walking. Do some practice steps in the restroom before heading back out into the crowd. You don't want to fall because of the repaired heel comes unglued. If you would rather, you can repair the heel and then dance without your shoes on. The glue should be completely dry by the time you leave. You won't have to touch up your nails during prom night, but if you're wearing nylons, you may get a snag in them and clear nail polish can help it from completely ripping down your leg. As soon as you see a small tear, dab some clear nail polish on it and let it dry. With all of the excitement, you might get a headache, stomachache or some other illness so bring something for everything. Just bring enough for one dose so you aren't walking around with a ton of medication. Let's face it, once you start dancing, your hair might not be as perfect as it was when you first walked in the door. To fix messed up hair, bring a trial size of hairspray, a small comb, and a hair tie in case you feel too hot to keep your hair down. Prom night is notorious for teenagers drinking and for some driving intoxicated. Don't ever get into a car with someone who has been drinking. It's better to call a parent or another friend to come to pick you up from wherever you are than risk your life. You may not be able to anticipate or control what will happen at prom, but at least you will be prepared and that should be enough to relax you so you can stop worrying and just have fun!